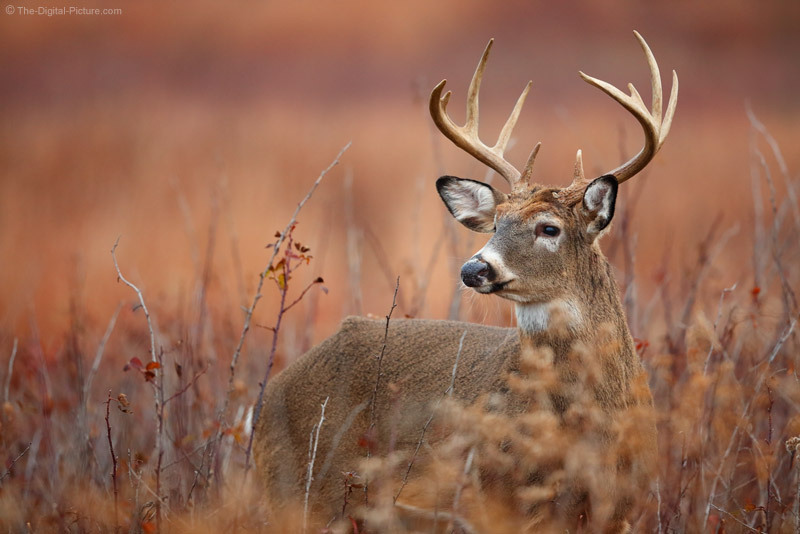 Still Two Spaces Available for SNP Whitetail Buck in Rut Wildlife IPT! I am very much looking forward to spending some time photographing whitetail buck during the rut in beautiful Shenandoah National Park this fall and would love to have you join me! The Wed-Sat spaces have been filled, but space for two people remains available during the Sun-Wed dates. Interested in taking your wildlife photography skills to the next level? join me! 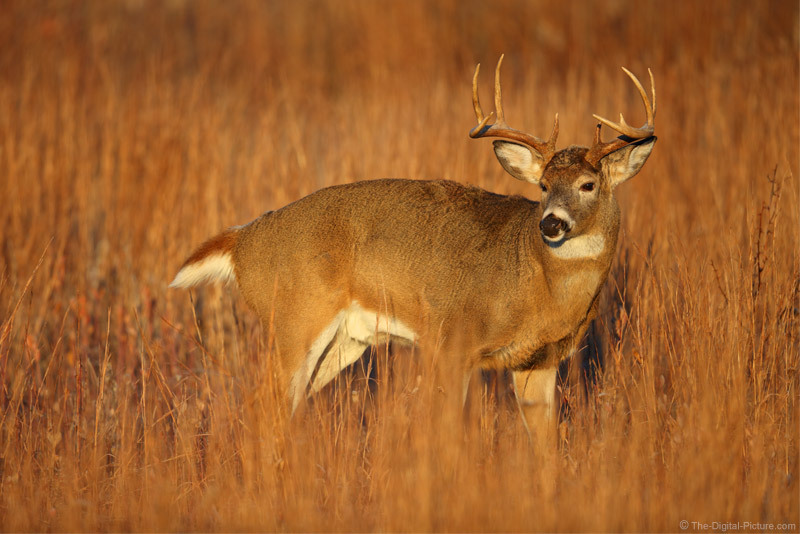 Permalink: Still Two Spaces Available for SNP Whitetail Buck in Rut Wildlife IPT! As I said when offering the Whitetail Fawns and More photo tour, meeting more of you is always high on my to-do list, I have wanted to offer photo workshops/tours/experiences for a long time (many of you have requested such) and my Shenandoah National Park commercial use permit is in hand. While I enjoy others enjoying my images, my primary goal is always to help you get great images and I'd love for you to join me for 3 or 6 days of wildlife and outdoor photography in this great location. I have cleared space in the schedule and made it through the logistical issues involved in making this trip happen, including acquiring the necessary SNP permit and having an important-for-wildlife-photography park policy change implemented (again, this will be one of the first tours falling under the new rules). Based on recent workshop survey results, this trip is offered in a choice of 3 or 6 full days (other options will be considered). The plan is to meet at the lodge on Sunday and/or Wed mid-day and we will wrap up after a morning shoot on the last day. Update: The Wed-Sat dates have been filled. Slots for only two people remain open during the Sun-Wed dates. I'd still love to have you along! Hopefully you, along with 3 others. Large groups are far more profitable from a business perspective, but seriously photographing wildlife in the field is very challenging in large groups. Keeping the group small means better opportunities and more personal attention. It also means that we can travel together throughout the park in one SUV. The cost for this IPT is $995 per 3 days with a 50% deposit locking in your spot. Email me at Bryan@Carnathan.com to sign up or ask questions! Our primary photo subject will be wildlife. Wildlife, by definition, is "wild" and that means it is unpredictable and there can be no guarantees. That said, Shenandoah National Park is a very reliable location to photograph whitetail deer and the environment/scenery here is quite photogenic. During much of the year, whitetail buck in SNP have their heads down feeding. 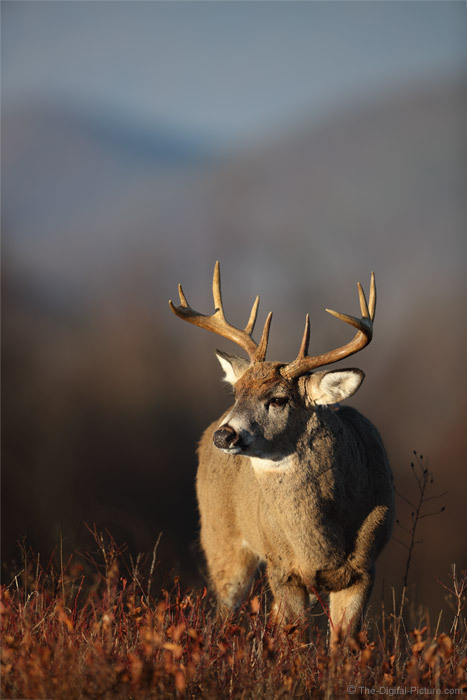 That changes during the rut and whitetail bucks exhibit great behavior at this time of the year. Late fall colors provide our backdrop and very few park visitors are expected at this time of the year, just prior to the last lodge closing for the season. 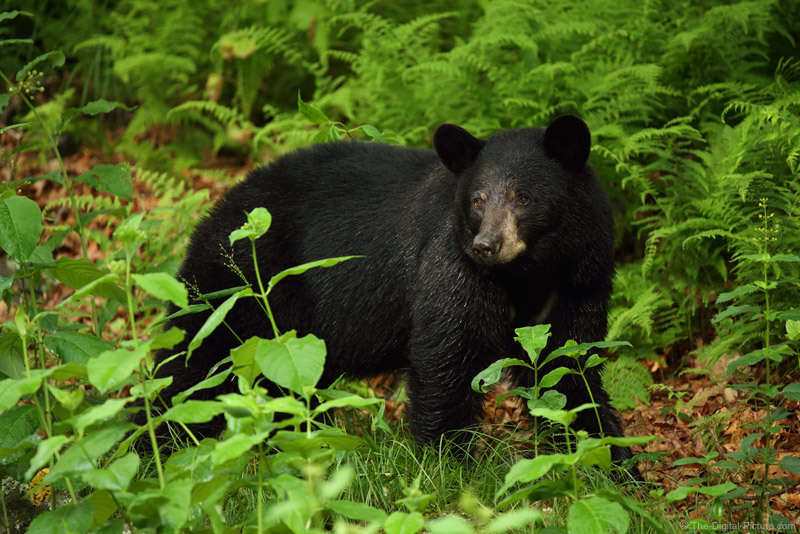 Deer are not the only wildlife subject found here and there is high likelihood that black bears will avail themselves as subjects along with a variety of birds and other smaller mammals. We will be opportunistic and take advantage of any subjects that we encounter – and discovering those moments are part of the excitement. In addition to the immersive wildlife photography experience, there will certainly be opportunity for some landscape photography. My time in the field is very limited and I look for locations with a high probability of good opportunities when I make the time investment. Shenandoah National Park rarely lets me down in that regard. Basically, we will work hard to improve your photography skills along with capturing some great images. And, we'll have fun along the way. As I mentioned with the fawn IPT, CWD (Chronic Wasting Disease) has been detected within 11 miles of SNP (according to the SNP wildlife biologist I talked to in Mar 2018). 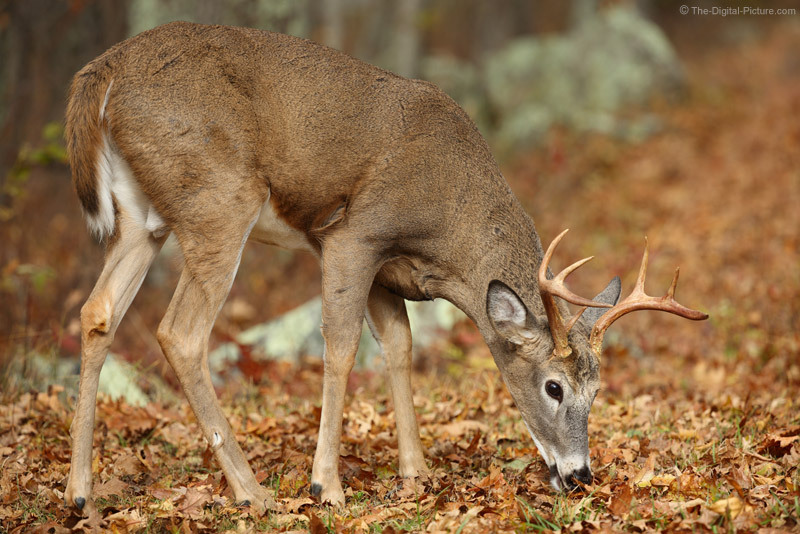 This awful disease is always fatal to deer and when it reaches within 5 miles of the park, implementation of an already-established plan will significantly reduce the deer population here. That means this awesome experience is at high risk and that is one of the reasons I chose this park first. While the implied definitions of these terms varies, I see "workshops" typically laid out with a planned schedule and "tours" typically designed to put you in front of subjects at the right time. I'm calling this trip a "tour" because the primary goal is for you to get great images and we will be opportunistic in that regard, making a firm schedule difficult to implement. That said, we will spend a lot of time together and I will teach, answer questions (bring many), critique images, assist in editing, etc. throughout our time together. Thus, the educational element will also be a primary part of our time together. In the field, we will photograph side-by-side. You taking great images home will be the primary goal, but you capturing those images yourself is important and I can best describe what you should do if I am doing it myself at the same time. This also provides the participant opportunity to watch how it is done. Your constant feedback and questions are important and will enable me to provide you with the best experience possible. This will be a modestly strenuous trip, with much of the strain dependent on the size and weight of the gear you are carrying. There will likely be some easy wildlife photography opportunities encountered, but we will be carrying our gear through the woods, tall grass and light brush over hilly terrain at times, often attempting to keep ahead of moving wildlife. Thus, one needs to be in reasonable physical condition. Transportation during the experience (if staying for the entire 6 days, I am happy to provide free transportation to and/or from the park from anywhere directly on my route from the north - primarily RT 81) along with everything described in the Tour/Workshop/Adventure/Expedition section above is included. By not including the items listed below in the fee, individuals are able choose their level of spending. Transportation to/from Skyland Resort including the required National Park entrance fee. Lodging. We will be staying at the Skyland Resort, a national park lodge. I usually get a basic room, but other options are available including cabins. Food. Because of the remoteness of this location, our food will primarily consist of what is offered at the Skyland Resort (dining room, take out or tap room) along with any food brought along into the park. We will typically begin photographing before food services are open so I usually pack breakfast to eat in my room prior to the morning shoots. I take a cooler with jugs of ice and ice is available at the lodge (you need bag/bucket to transport it from the ice machine). I suggest packing granola bars and other snacks along to keep energy levels up while photographing (especially in case we find an amazing subject that we don't want to leave). Plan to have water or other drink available to take with you. At this time of the year, the days are getting shorter and the nights are correspondingly getting longer. Our best opportunities will be found early and late in the day and we will target these times, but sometimes it is worth staying out all day. The sun is relatively low in the sky and the animals often remain active during the day. We will take time to review images, especially back at the lodge in the evening. These plans are all very flexible and we can target any specific interests the group has. Travel insurance is strongly recommended. If a cancellation notice is received between 90 and 179 days before the workshop start date, a 50% refund of any payments made will be provided. If a cancellation notice is provided within less than 90 days of the workshop, no refund of payments made will be provided. Regardless of the cancellation notice received date, any workshop openings that are re-filled will be refunded payment in full minus a $195 administrative fee. 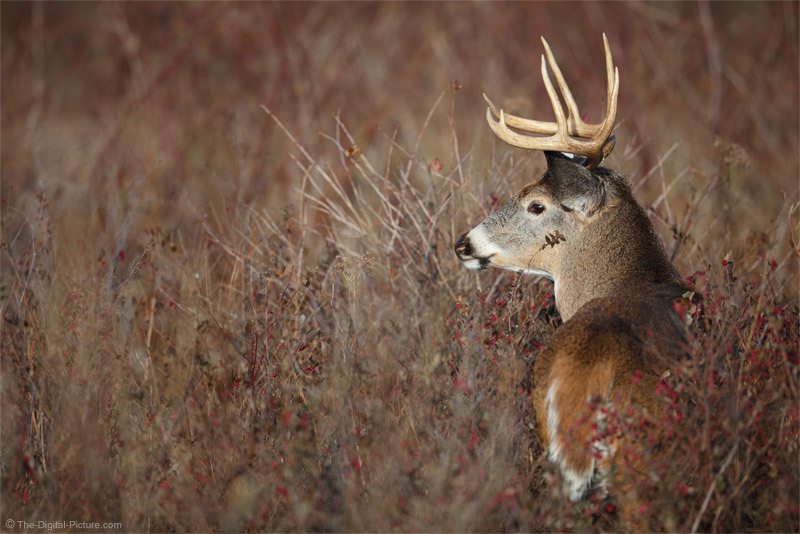 When photographing bucks in rut, I am not as concerned about a fast frame rate as with some other subjects. 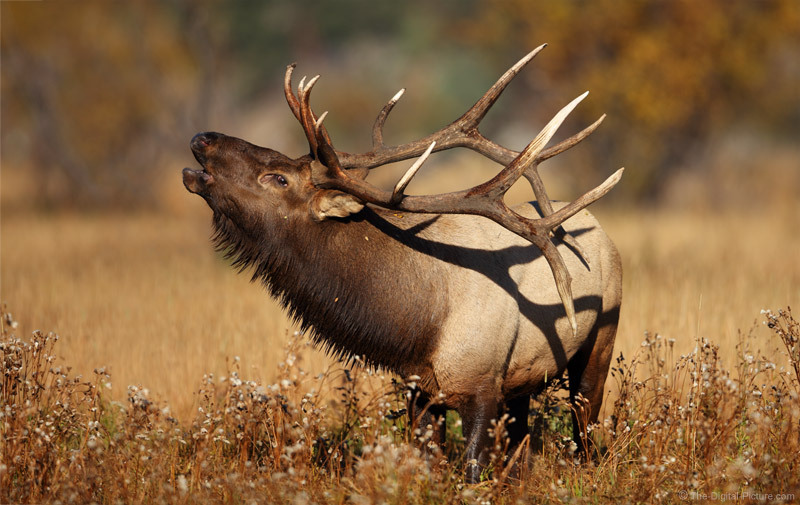 There will be times when the fast rate is beneficial, but rut posturing is often done at slower speeds and I usually opt for higher resolution cameras. A DSLR camera or a late-model MILC (Mirrorless Interchangeable Lens Camera) should be in your bag. A telephoto lens or lenses will be needed with a full-frame equivalent of at least 400mm (250mm on an APS-C) suggested and having longer focal lengths available will be appreciated at times. Wildlife activity is greatest early and late, so wide apertures are often an advantage and the wide aperture's ability to blur the background can be useful. Any telephoto lens can work, but there may be times when an f/4 or wider aperture is preferred. This is a great event to break out your big lenses for and it is also a great time to try a new one, perhaps via renting. My current plan is to take the Canon EOS 5Ds R along with the Canon EF 600mm f/4L IS II USM Lens and Canon EF 100-400mm f/4.5-5.6L IS II USM Lens for my primary wildlife kit with the Canon EF 200-400mm f/4L IS USM Lens (with built-in 1.4x extender) likely seeing some use. In addition, I'll take a Canon EOS-1D X Mark II in case I decide that I want the fast frame rate. I'll bring a variety of other lenses and accessories including a Black Rapid shoulder strap to carry the big lenses with. We can potentially make use of a full range of landscape photography gear, including ultra-wide to wide angle lenses along with circular polarizer and neutral density filters. Bringing a laptop is highly recommended, enabling review of your images throughout the time we have together. Bring an external hard drive for an additional level of backup. Bring adequate memory card capacity, enough batteries to last at least a day and enough chargers to restore that capability overnight. The weather in late November is typically very nice, though cool, in Shenandoah National Park. However, the mountain can create its own weather and that can be at least somewhat unpredictable. Rain gear may be very appreciated at times, including rain covers for camera gear while in the field. Plan for walking in light brush (including mild briars) and woods. The wildlife we are pursuing is acclimated to humans and they do not seem to care what we are wearing (though you might get their attention if you dress in all black like a black bear, a primary deer predator). Camo clothing is not necessary, but it is a good option. I wear mostly camo and part of the reason is to be less obvious to other park visitors, though there are not many at this time of the year. Insects can be annoying at this location, but they are not typically bothersome in mid-November. Ticks are reportedly present, though I have yet to find one on me. As many of you are aware, I recently made an instructional photo tour available. I am gauging interest in additional photography workshops / tours / expeditions / experiences ("workshop" hereafter) and if you are interested in joining me on such, I would be grateful for some feedback in the form of answers to a short survey. Meeting more of you is always high on my to-do list, I have wanted to offer photo workshops/tours/experiences for a long time (many of you have requested such) and my Shenandoah National Park commercial use permit just arrived. While I enjoy others enjoying my images, my primary goal is always to help you get great images and I'd love for you to join me for nearly a week of wildlife and outdoor photography in this great location. I have cleared space in the schedule and made it through the logistical issues involved in making this trip happen, including acquiring the necessary SNP permit and having an important-for-wildlife-photography park policy change implemented (this will be one of the first tours falling under the new rules). Due to the latter issues, this is a relatively short-notice trip. The plan is to meet at the lodge on Sunday afternoon, just as the park's busyness of the weekend is winding down, and we will wrap up after a morning shoot on Saturday, as the park gets busy again. Hopefully you, along with 2 or 3 (at most) others. While large groups are far more profitable from a business perspective, photographing wildlife in the field is challenging in large groups and keeping the group small means better opportunities and more personal attention. $2,250 due in full to lock in your spot. Email me at Bryan@Carnathan.com to sign up or ask questions! Our primary photo subject will be wildlife. Wildlife, by definition, is "wild" and that means it is unpredictable and there can be no guarantees. 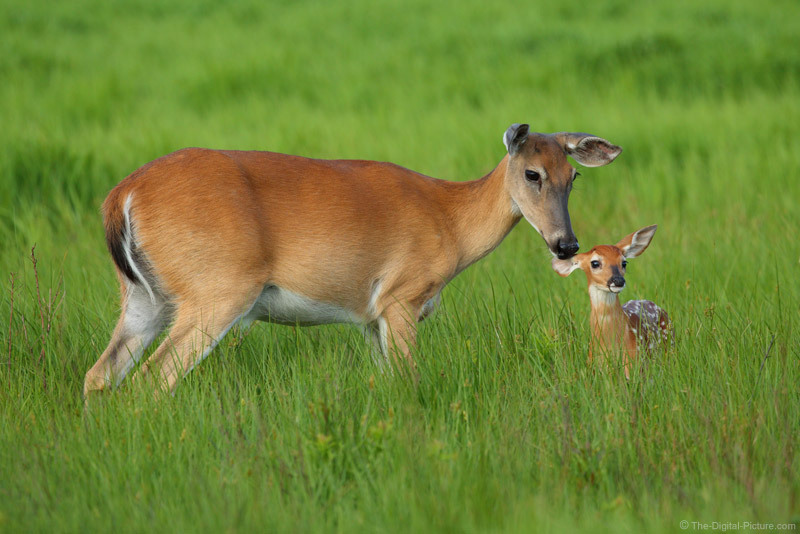 That said, Shenandoah National Park is one of the best locations in the world to photograph whitetail deer and whitetail fawns are one of the cutest creatures on the face of this planet (it seems that everyone loves pictures of them). 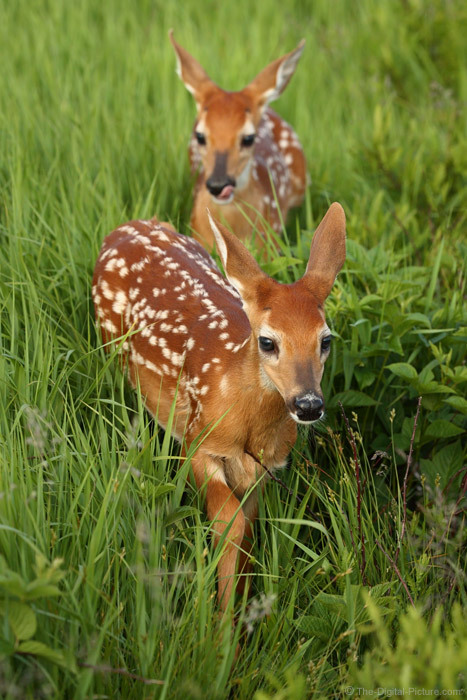 The timing for this trip is such that most of the fawns will be recently-born and the foliage for the always-important image backgrounds should include beautiful bright green colors. Even with the high whitetail density found in SNP, fawns remain quite challenging to photograph, but the rewards are worth the effort. Deer are not the only wildlife subject found here and there is high likelihood that black bears will avail themselves as subjects along with a variety of birds and other smaller mammals. We will be opportunistic and take advantage of any subjects that we encounter - and those moments are part of the excitement. In addition to the immersive wildlife photography experience, there will certainly be opportunity for some landscape photography. My time in the field is very limited and I need to have a high probability of good opportunities when I make such time investment. SNP rarely lets me down in that regard. Basically, we will work hard to capture some great images, attempting to build out your portfolio and light up your social feeds as well as working on improving your photography skills. And, we'll have fun along the way. CWD (Chronic Wasting Disease) has been detected within 11 miles of SNP (according to the SNP wildlife biologist I talked to in Mar 2018). 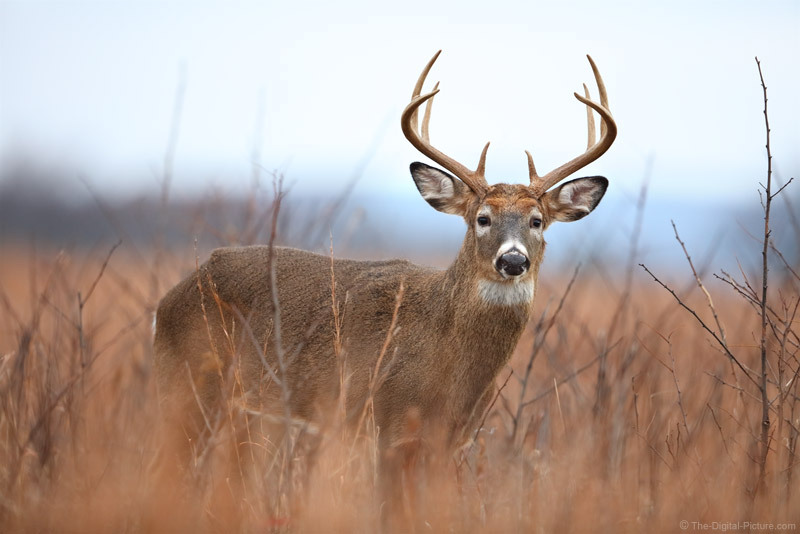 This awful disease is always fatal to deer and when it reaches within 5 miles of the park, implementation of an already-established plan will significantly reduce the deer population here. That means this awesome experience is at high risk and that is one of the reasons I chose this photographic opportunity first. While the implied definitions of these terms varies, I see "workshops" typically laid out with a planned schedule and "tours" typically designed to put you in front of subjects at the right time. I'm calling this trip a "tour" because the primary goal is for you to get great images and we will be opportunistic in that regard, making a firm schedule difficult to implement. That said, we will spend a lot of time together and I will teach, answer questions (bring many), critique images, assist in editing, etc. throughout our time together. Thus, the educational element will certainly be there. In the field, we will photograph side-by-side. You taking great images home will be the primary goal, but you capturing those images yourself is important and I can best describe what you should do if I am doing it myself at the same time. This also provides the participant opportunity to watch how it is done. Your constant feedback and questions are important and will enable me to provide you with the best experience possible. An "expedition" is another type of immersive photography experience and this event involves multiple daily mini-expeditions. Certain is that we will have an adventure. Transportation during the experience (I am happy to provide free transportation to and/or from the park if you are directly on my route from the north - primarily RT 81) along with everything described in the Tour/Workshop/Adventure/Expedition section above is included. By not including the items listed below in the fee, individuals are able choose their level of spending. Transportation to/from Big Meadows Lodge including the required National Park entrance fee. Lodging. We will be staying at the Big Meadows Lodge. I usually get a very basic lodge room, but other options are available, ranging from camping to cabins. Food. Because of the remoteness of this location, our food will primarily consist of what is offered at the Wayside Diner or the park lodges along with any food brought along into the park or purchased at the camp store. Because it gets light very early at this time of the year (getting enough sleep will be one of our challenges), we will begin photographing before services are open. I usually pack breakfast to eat in my room prior to the morning shoots. I take a cooler with jugs of ice and ice is available at the lodge (you need bag/bucket to transport it from the ice machine). Typically, we will eat second breakfast/early lunch (or perhaps both) at the Wayside Diner (usually open 8-8 at this time of the year) or optionally the lodge and we will likely eat at the lodge for early or late dinner (it closes at 9:00). I suggest packing granola bars and/or bringing other snacks along while photographing (especially in case we find an amazing subject that we don't want to leave). Plan to have water or other drink available to take with you. At this time of the year, the days are long and the nights are correspondingly short. Our best opportunities will be found early and late in the day and we will target these times. Fatigue can kill mental and physical sharpness, so we will usually return to our rooms mid-day for some downtime and a nap. We will go back out mid-late afternoon and stay out until the light level drops too low for good images. These plans are all very flexible and we can target any specific interests the group has. Travel insurance is strongly recommended. As this tour is being scheduled close to the tour dates and because of the small group size, no refund can be offered for cancellation. 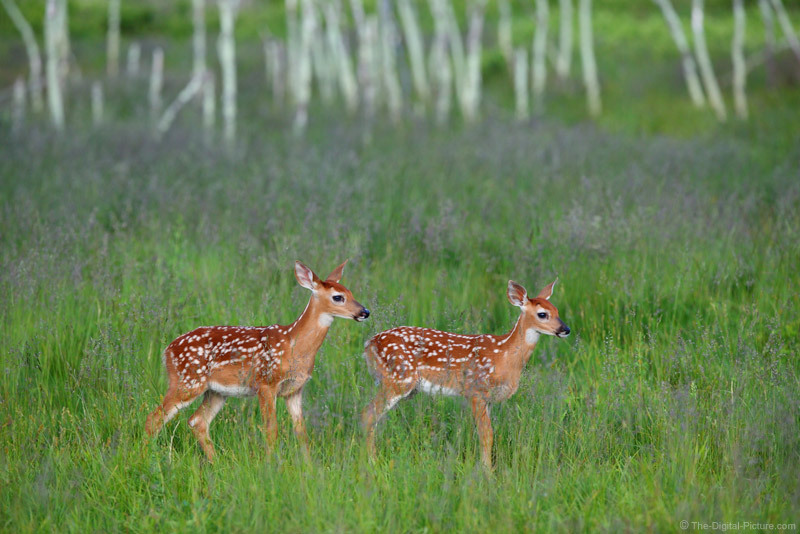 For fawns, a camera with a reasonably fast frame rate (fawns are almost constantly moving) and high-performing AF system is preferred, but not required. This generally means a DSLR camera or a late-model MILC (Mirrorless Interchangeable Lens Camera) should be in your bag. My current plan is to take a Canon EOS-1D X Mark II along with the Canon EF 200-400mm f/4L IS USM Lens (with built-in 1.4x extender) and Canon EF 100-400mm f/4.5-5.6L IS II USM Lens as my primary wildlife kit. In addition, I'll take at least one Canon EOS 5Ds R body and will likely bring a Canon EF 600mm f/4L IS II USM Lens. I'll bring a variety of other lenses and accessories including a Black Rapid shoulder strap to carry the big lenses with. It is highly recommended to bring a laptop, enabling review of your images throughout the time we have together. Bring an external hard drive for an additional level of backup. Bring adequate memory card capacity, enough batteries to last at least a day with enough chargers to restore that capability overnight. Plan for walking in brush (including mild briars) and woods. The wildlife we are pursuing is acclimated to humans and they do not seem to care what we are wearing (though you might get their attention if you look like a black bear, a primary deer predator). Camo clothing is not necessary, but it is a good option. I wear mostly camo and part of the reason is to be less obvious to other park visitors. Insects can be annoying and ticks are reportedly present (I have yet to find one on me at this location). Permethrin and other insect repellent may be appreciated and I also wear a ball cap to help keep gnats out of my eyes (and avoid sunburn). Especially mid-day, shorts may prove the most comfortable option at times.